Finally, here it is, the last installment of my travelogue. This section is about Chengdu, the capital of Sichuan Province. We were only there for two days but it was fun, and involved pandas! Chengdu was the birthplace of the first widely used paper money in the world (Northern Song Dynasty, around A.D. 960). Chengdu has half the population of Shanghai, but more tea houses and bars. Of the world’s 500 largest companies, 133 have subsidiaries/branch offices in Chengdu. Chengdu’s airport is the 6th busiest nationwide, with a total of 17.25 million passengers in 2008. On June 5th, a bus caught fire in Chengdu; the arsonist was a man in his sixties. 27 people died and 76 were injured. The city of Haikou reacted by outfitting public buses with 400 emergency hammers; over half the hammers were stolen from the buses within three days. The Wenchuan Earthquake in May 2008 killed about 70,000 people, injured nearly 400,000 more, and left nearly 5 million people homeless. Another 18,000 people are still listed as missing. Wenchuan is 80km northwest of Chengdu. Our delayed flight from Jiuzhai Huanglong airport landed in Chengdu sometime after midnight. We had opted to have the hotel send a car to collect us which was lovely given how late we got in. The driver was a sweet lady who found my Beijing accent amusing! The hotel was a courtyard style building, and our room was clean. That’s about all I noticed before falling into bed. Breakfast was a funny mix – some of the items on the set meal were all gone since it was nearly the end of breakfast time (the parents were still firmly in bed). I had steamed pork buns, jasmine tea, fruit, and a plate of whatever stirfried stuff was still there, I think! One of my kids from Beijing (David) now lives in Chengdu, and he swung by to hang out which was lovely! We went for a wander and I bought some ridiculous shoes and then we went back for the parents. We went out for dinner – David took us to a courtyard place he knew, and we ordered a mix of things he knew were good there and things that just seemed good. The table was quickly full and so were we! It was good food. The parents enjoyed the soundtrack of English language ballads – the sort of music that is pretty standard fare across China. David and I got talking about this, and soon after we mentioned the Titanic theme song (a staple here) it came up in the mix. We took the parents home to the hotel and chatted for a bit, then David took me to one of his favourite hangouts. I rode side saddle on the back of his electric scooter to get there, which was fun! We hung out for a few hours, then stopped at a little stall to eat some cheap food before I went home to get some sleep – I had to be up early in the morning! 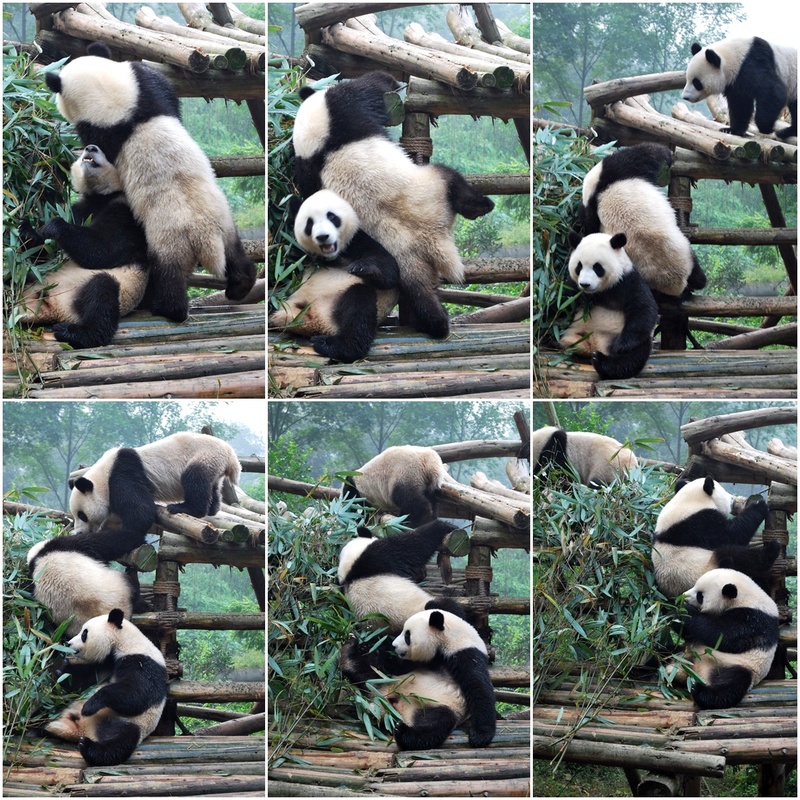 I had booked us a trip to a panda centre in the morning – pandas being one of The things to do in Chengdu. The driver the hotel provided was none other than the same lovely lady who had picked us up at the airport. 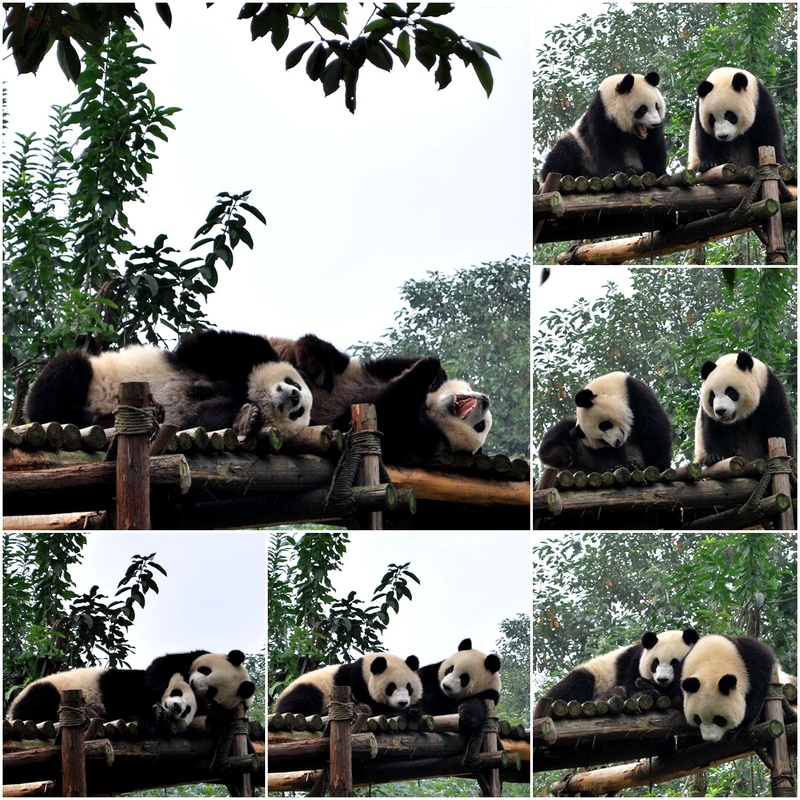 We visited the Chengdu Panda Breeding Research Center, 10km from the centre of town . The centre grounds were surprisingly beautiful, with most walkways lined by avenues of bamboo that came together in the centre, making each walkway into an enclosed corridor of sorts. 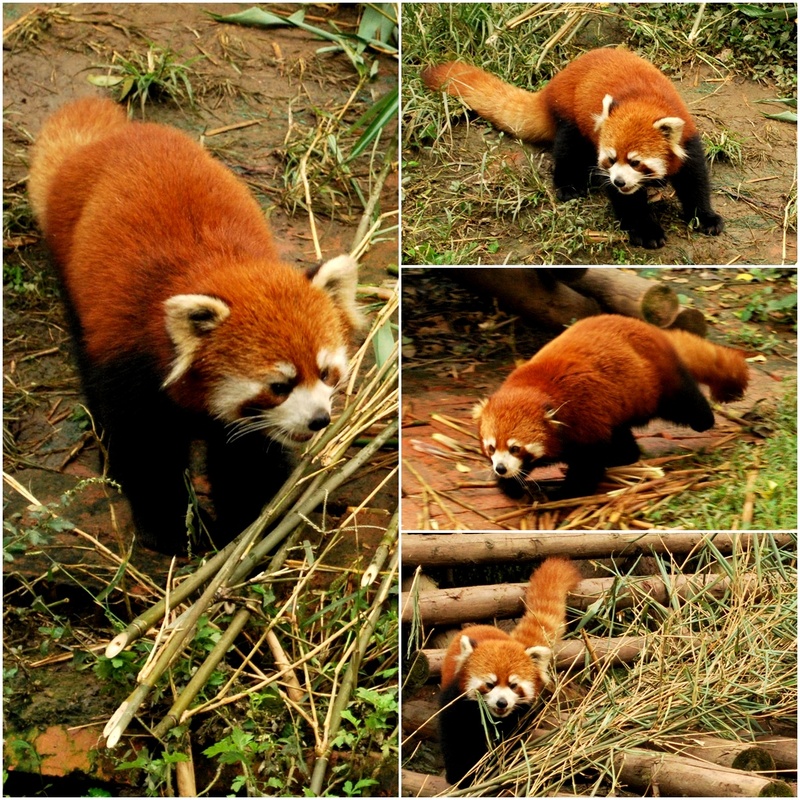 We opted to go see the Red Pandas first, since they are Mum’s favourite. There were several enclosures, with the pandas quite active. The main enclosure had 5 individuals running around. We were just about ready to leave when the pandas started to really perk up. Dad took just a few more photos and then a keeper came along and threw apple pieces to the pandas. They were so cute, sitting in a row waiting for their apples! Next we visited some adolescent Giant Pandas, who were also busy with their breakfast. They wandered around (and over) each other and were generally quite cute. Next we went up to the breeding centre where we saw a pregnant mum and then went inside to see some real babies! There were four pandas from 1-4 months of age – so small and fluffy, they looked like stuffed animals! We were herded past quite quickly and photos were definitely not allowed! We spent a bunch more time watching pandas in a bunch of different enclosures. We stopped at to see the video of the centre and chatted to some other tourists. One lady told us they hadn’t been able to see the red pandas – some bigwig was visiting and the exhibit had been temporarily closed to the general public. It seems our decision to go there first was fortuitous! Eventually we made our way back to the van and were driven to the airport to catch our flights out. I say flights, plural, because this was where we would split off – I flew back to Beijing (then back to work in Langfang) and the parents flew to Dunhuang, in far western Gansu Province, to ride camels up and down sand dunes and things like that.